Golf season is approaching! Some may ask about particular stretches you can do to get ready for golf season or techniques on getting the ball further. However, in this video, Dr. Jason Lemieux points out how none of those aspects really matter, unless you focus on your golf swing. In the following video, Dr. Jason Lemieux shows us a variety of different techniques in getting ready for golf season. 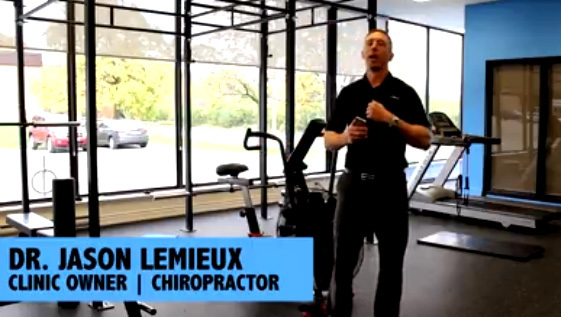 Dr. Lemieux: So I'm Dr. Jason Lemieux, I'm a chiropractor and the owner of Physiomed Oakville, and today we're talking about getting ready for golf season. So a lot of times when we talk about the prep for golf season, we're talking about what's gonna let me hit the ball further, or what stretches do you need to do to not get hurt in golf or to play better golf. To be honest, none of that really matters if your swing is garbage. And we see that the number one thing that causes injuries in golfers or at least back pain in golfers is something called a reverse spine angle. What that means is, it means you're inefficient at transferring energy. When you look at the best golfers in the world, when they get to the top of their back swing, if I'm a right-handed golfer and I'm hitting the ball that way, at the top of my back swing, I want my spine to be tilted that way. So I want my spine at the top of my swing to be facing away from my target. We'll see a lot of amateur golfers, recreational golfers, they want to hit it further, they thing they have to take a big back swing, and if we look at a line from my belt to my chest, as they take the club back, they end up with their spine tilted towards the target. That puts your back in extension, and now as I try to go and hit the ball, I end up doing something called a reverse pivot. It gets me on my back foot, means you don't hit the ball very well at all, and you absolutely crush your low back. So don't get hurt and don't hit the ball not far, let's try to play better golf and not get hurt. So we want to end up in a position where I load my trailing side and get my body in a good position. So, one of the reasons that that happens is, people's low back muscles will take over rather than their core. I don't keep my rib cage down, if you think of the distance between the bottom of my rib cage and my pelvis, as I get into position, if I let that distance between my hands get bigger, my low back has taken over and my abs have shut off. So we're gonna go through a couple of progressions to activate our core, and then a little drill that can give you that sensation of what should it feel like when I hit the top of my back swing. So, if we quickly come over here, we're going to grab... Tina's gonna come down into what we look at as one of our basic core exercises. She's gonna come down into a plank. So she's going to lunge her way down on the mat, she's gonna come down onto her forearms, she's gonna make good strong fists, she's gonna make sure that her spine is neutral, so there's no arch in her back. That's awesome. She's gonna be squeezing her glutes, keeping her rib cage down, she's even making strong fists, she's using all of the muscles in her upper body, her lower body, and her core. If you're working out with a partner, you can actually challenge the person by trying to break them, trying to push them down to the floor, trying to push them side to side, challenge the stability. And again, this will can us a better sensation of what it's like to activate our core. That's great, come down. But you don't play golf down on all fours, so we're going to Tina...she's gonna come down kneeling...so now I've got my spine vertical, closer to what it would be like when I'm actually playing golf, we're gonna bring our hands out in front of us, she's again gonna think about bringing her rib cage down, squeezing her glutes. I'm gonna try to lift her arms up. So now if she's not able to stabilize, it's gonna flare her rib cage up, but she's gonna keep her core active, her glutes tight, as we hold that position. And again, just doing little sets of 5, 10 seconds. What do we feel doing most of the work as we hold ourselves in this position? Tina: My core. Dr. Lemieux: Good. Excellent. So we're able to keep our spine stable. If you don't have a partner, you can go to a cable machine from the gym, pull down kind of a tricep rope or something that's gonna want to lift you up, forcing you to have to feel what it's like to recruit your core to keep your spine stable. We can bring one leg out in front of us, actually we'll switch legs, we're gonna bring one leg up in front of us. Golf is a rotational sport so I don't just want to be able to stabilize my core in extension, I've got to be able to do it in rotation. So she can bring both arms out again, this time I'm gonna try to rotate her arms and her shoulder, she's gonna use her glutes and her core to again keep her rib cage stable and resist rotation. I've got to learn how to throw the breaks on before I learn how to accelerate. So again if we can stabilize that core, that's gonna help to keep my back stable. Then we're going to come standing all the way up, and we're gonna switch roles here. I'll demonstrate something. We're going to use this ball. So I'm going to have...Tina's going to hold the ball or I could put it on a dumbbell rack or anything where it's about mid-rib cage height, and I'm gonna stand so that it's just an inch or two outside my reach. I'm going to get down into a golf posture, and I'm gonna make as though I got to my back swing, and I'm gonna force myself to reach for the ball. So, if you can let go of the ball. So now as I hold the ball in this position, my spine exaggerated what I want. My spine is definitely not tilting back towards the target and I can feel, as I have to reach for the ball, what it's like to get my weight into my trailing hip and into my lower body. So this is a little progression of, thank you, from plank on the ground, to some core-activation kneeling, to how do I get into that better position and feel the right muscles engage when I'm standing. You can take that as part of your warm-up. Get out to the range, don't try this brand new on the course, and start getting better feels of, where do I need to be at the top of my back swing so I don't end up in that reverse spine angle. Because if you do, it's a matter of when, not if, you're gonna have back pain.